DiMarzio®/IBZ pickups ada di gitar Ibanez RG2120 and RG2570EX di desain secara spesifik dan khusus dari DiMarzio® utkIbanez. Like a higher output '59 Model with a deeper bottom end and expanded output. Perfect for pop, country, blues, classic rock and heavy rock. Nickel or gold-plated cover. Trembucker. Available in 7-string. DiMarzio®/IBZ pickups ada di gitar Ibanez RG2120 and RG2570EX di desain secara spesifik dan khusus dari DiMarzio® untukIbanez. 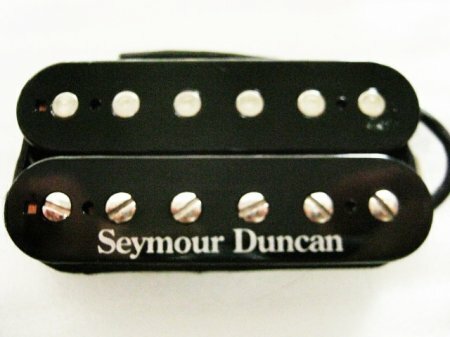 Dimarzio DP 187 "the cruiser"
All that single-coil sound and none of the noise. posisi : nridge , bisa juga dipakai di neck. has been used for the last 40 years to create all styles of music from Country to Rock, Blues and even Jazz. Original USA , no box.